Authors: Peter Plavchan et al. To date, we have confirmed more than 1500 extrasolar planets, with over 3300 other planet candidates waiting to be confirmed. These planets have been found with different methods (see Figure 1). The two currently most successful are: the transit method and the radial velocity method. The former measures the periodic dimming of a star as an orbiting planet passes in front of it, and tends to find short-period large-radius planets. The latter works like this: as a planet orbits around its host star, the planet tugs the host star causing the star to move in its own tiny orbit. This wobble motion —which increases with increasing planet mass— can be detected as tiny shifts in the star’s spectra. We just found a planet. That being said, in our quest to find even more exoplanets, where do we invest our time and money? Do we pick one method over another? Or do we spread our efforts, striving to advance all of them simultaneously? How do we assess how each of them is working; how do we even begin? Here it pays off to take a stand, to make some decisions on how to proceed, to set realistic and achievable goals, to define a path forward that the exoplanet community can agree to follow. 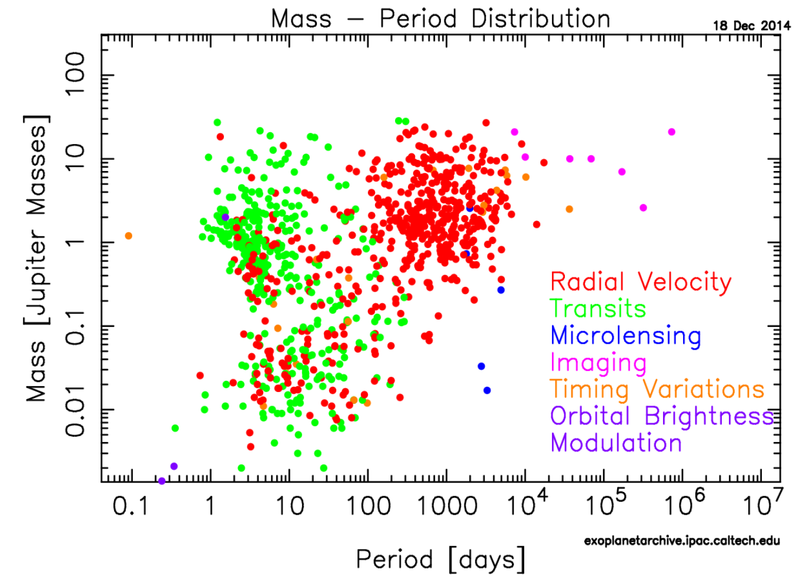 Figure 1: Currently confirmed planets (as of December 2014), showing planetary masses as a function of period. To date, the radial velocity method (red), and the transit method (green), are by far the most successful planet-finding techniques. Other methods include: microlensing, imaging, transit timing variations, and orbital brightness modulation. Figure 42 from the report. To do this effectively, and to ensure that the US exoplanet community has a plan, NASA’s Exoplanet Exploration Program (ExEP) appoints a so-called Program Analysis Group (ExoPAG). This group is responsible for coordinating community input into the development and execution of NASA’s exoplanetary goals, and serves as a forum to analyze its priorities for future exoplanetary exploration. Most of ExoPAG’s work is conducted in a number of Study Analysis Groups (SAGs). Each group focuses on one specific exoplanet topic, and is headed by some of the leading scientists in the corresponding sub-topic. These topics include: discussing future flagship missions, characterizing exoplanet atmospheres, and analyzing individual detection techniques and their future. A comprehensive list of the different SAGs is maintained here. One of the SAGs focused their efforts on analyzing the current and future prospects of the radial velocity method. Recently, the group published an analysis report which discusses the current state-of-affairs of the radial velocity technique, and recommends future steps towards increasing its sensitivity. Today’s astrobite summarizes this report. 1-2: Radial velocity detection sensitivity is primarily limited by two categories of systematic effects. First, by long-term instrument stability, and second, by astrophysical sources of jitter. 3: Finding planets with the radial velocity technique requires large amounts of observing time. We thus have to account for what telescopes are available, and how we design effective radial velocity surveys. We won’t talk so much about the last category in this astrobite. But, let’s dive right into the former two. No instrument is perfect. All instruments have something that ultimately limits their sensitivity. We can make more sensitive measurements with a ruler if we make the tick-marks denser. Make the tick-marks too dense, and we can’t tell them apart. Our sensitivity is limited. Astronomical instruments that measure radial velocities —called spectrographs— are, too, limited in sensitivity. Their sensitivity is to a large extent controlled by how stable they are over long periods of time. Various environmental factors —such as mechanical vibrations, thermal variations, and pressure changes— cause unwanted shifts in the stellar spectra, that can all masquerade as a radial velocity signal. Minimize such variations, and work on correcting —or calibrating out— the unwanted signals they cause, and we increase the sensitivity. Not an easy job. 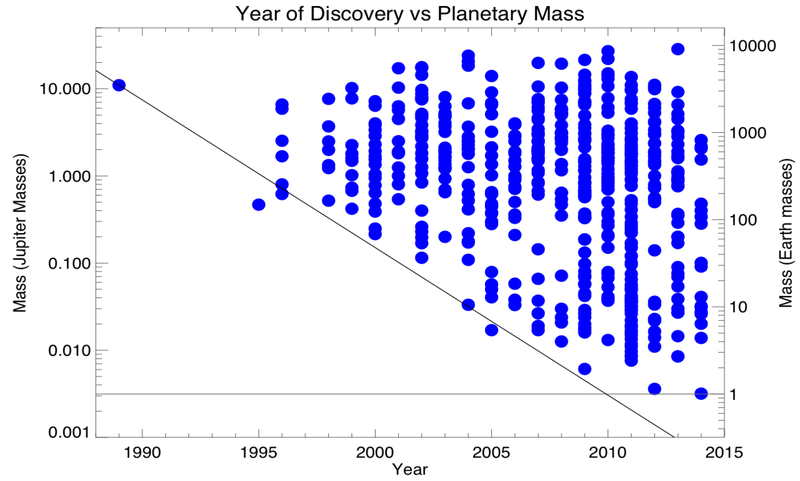 Figure 2: Masses of planets detected with the radial velocity technique, as a function of their discovery year. More planets are being found each year, hand-in-hand with increasing instrument sensitivity. For transiting planets the actual masses are plotted, otherwise the minimum mass is plotted. Figure 43 from the report. Still, it can be done, and we are getting better at it. Figure 2 shows that we are finding lighter and lighter planets — hand-in-hand with increasing instrument sensitivity: we are able to detect smaller and smaller wobble motions. Current state-of-the-art spectrographs are, in the optical, sensitive down to 1m/s wobble motions, and only slightly worse (1-3m/s) in the Near Infrared. To set things in perspective, the Earth exerts a 9cm/s wobble on the Sun. Thus, to find true Earth analogs, we need instruments sensitive to a few centimeters. The authors of the report note that achieving 10-20cm/s instrument precision is realistic within a few years — some such instruments are even being developed as we speak. Further push on these next generation spectrographs is strongly recommended by the authors; they support a path towards finding Earth analogues. Having a perfect spectrograph, with perfect precision, would, however, not solve the whole problem. 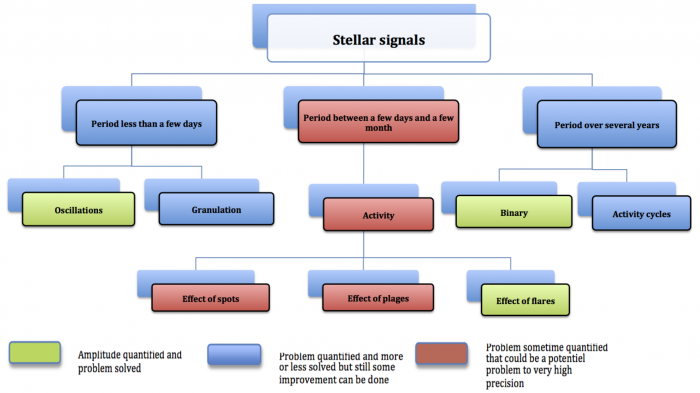 This is due to stellar jitter: the star itself can produce signals that can wrongly be interpreted as planets. Our ultimate sensitivity or precision is constrained by our physical understanding of the stars we observe. Stellar jitter originates from various sources. The sources have different timescales, ranging from minutes and hours (e.g. granulation), to days and months (e.g. star spots), and even up to years (e.g. magnetic activity cycles). Figure 3 gives a good overview of the main sources of stellar jitter. Many of the sources are understood, and can be mitigated (green boxes), but other signals still pose problems (red boxes), and require more work. The blue boxes are more or less solved. We would like to see more green boxes. Figure 3: An overview diagram of stellar jitter that affects radial velocity measurements. Note the different timescales. Green boxes denote an understood problem, but the red boxes require significant more work. Blue boxes are somewhere in between. Figure 44 from the report. The radial velocity method is one way to discover and characterize exoplanets. In this report, one of NASA’s Study Analysis Groups evaluates the current status of the method. Moreover, with input from the exoplanet community, the group discusses recommendations to move forward, to ensure that this method continues to be workhorse method in finding and characterizing exoplanets. This will involve efficiently scheduled observatories, and significant investments in technology development (see a great list of current and future spectrographs here), data analysis and in our understanding of the astrophysics behind stellar jitter. With these efforts, we make steps towards discovering and characterizing true Earth analogs. Full Disclosure: My adviser is one of the authors of the SAG white paper report. I chose to cover it here for two reasons. First, I wanted to further your insight into this exciting subfield, and secondly, likewise, my own. The astrophysical “jitter” must be the real demon of this problem. I read about a system that for a long time believed to have a third exoplanet but it was confirmed by the authors of the paper that the signal was from magnetic activity of the parent star. Apparently, removing these false sources even improved the signals for the confirmed existing planets in the system, so solving these demons sure has its benefit. Hi Jimmy. Yes, you are absolutely right. Stellar jitter/activity is still an important uncertainty factor in finding exoplanets with this method, and just looking into stellar jitter is an active field of research today. And yes, like in the paper you mentioned, we have found some ways to check if a radial-velocity signal is correlated with stellar jitter. If so, it’s likely caused by the star (not by a planet); if not, then it’s even more likely that the signal is caused by a planet. If we have a spot on the surface of a star that is rotating around, what’s the basic idea that allows us to distinguish it from an exoplanet? Great question Henry. On the short term the star spots will look pretty much the same as a planet signal. But stars rotate deferentially, and that can smear out the star spots, and thus smear out the fake planet signal. Star spots are created by magnetic activity in the star. So in practice what you do is to look at certain lines that trace stellar magnetic activity. This way you can be more informed if you are dealing with a signal masquerading as a planet (e.g. a star spot), or a real planet signal. This is still an active field of research today, illustrating how our knowledge of stellar physics is still a work in progress. You mention that instruments with 10-20cm/s precision are currently in development – how cool! Where are these instruments being developed? I agree Anne! For example G-CLEF (~20cm/s) for the Giant Magellan Telescope, and ESPRESSO (~10cm/s) for the Very Large telescope. Then there is also CODEX for the European Extremely Large Telescope, which has an ambitious goal of 2cm/s! The Earth exerts a 9cm/s wobble on the Sun — interesting times lie ahead. How much of the instrument instability could be removed by using instruments in space? Is there a reason (beyond costs) that my (admittedly brief) look into the instruments used for radial velocity exoplanet detection suggested that they’re largely ground-based? You are right Sam, almost all radial-velocity (RV) surveys are currently done from the ground. There is one space mission that I know of: ESA’s Gaia mission which the Radial Velocity Spectrometer (RVS) on-board. It will get RV velocities of millions of stars with a few km/s precision. We are achieving much higher precision on the ground, usually by using big telescopes which take repeated spectra of one star at a time. Doing things in space has numerous perks: no atmosphere, no telescope wind-shake, no Sun coming up every 12 hours. Doing things in space thus has great potential, and I’m sure we can design space-probes that approach very high accuracies (~1-2cm/s), but the two main drawbacks I see are: 1) space-probe costs and 2) you need precise wavelength calibrators that run reliably for a very long time. Our current best calibrators —called Laser Frequency Combs— are expensive, and sometimes need help from experienced laser physicists to run properly. They are currently under active development, and are improving. Hopefully we can make them light enough and send one into space soon.